This has definitely not been the summer of nonstop fishing. Thankfully I have still managed to get out often enough to avoid suffering through withdrawals. My most recent trip was one that just kind of happened at the last minute, and what a trip it was! One of my best friends was in the area for a couple of weeks prior to his upcoming wedding. He wanted to get together and float a few hours. Naturally I couldn't say no to that, so we made plans to hit the river Friday afternoon. He isn't a fisherman but didn't mind me bringing a fly rod along. When we arrived at the river, I was pleasantly surprised to see a lot of activity from the fish. Rises, jumping trout, everything telling me that I might catch a few. Strangely, I couldn't get any to play at first. I had rigged up with something other than the flavor of the day unfortunately, and out of pure laziness I stuck with it a bit too long. Once I changed over to a midge things improved quickly. We paddled down the river, lazily drifting along for the most part on the low water. Every now and then I would switch rods. The midges were producing well, but I really didn't have any follows on the streamer as far as I could tell. In one spot we beached the kayak to wade a bit. Fish were feeding heavily throughout the run, and I caught my first Caney slam in awhile. The only noteworthy fish was the brookie. Striper season 2010...finally time to start chasing them again!!! Backpacking in the Smokies is always an enjoyable experience. I've been looking forward to the opportunity to do so for awhile and couldn't wait to get on some of my favorite water in the Park. Unfortunately the best of plans don't always work out. Due to several factors, we had to cancel the Smokies trip. To salvage the weekend, my cousin Nathan decided to come up to Crossville instead, and we planned on floating the Caney. Originally we planned on taking my canoe, but when David Perry from Southeastern Fly asked if we were interested in floating with him, we both thought that would be a good idea. This turned out to be perfect since David knows the river so well. He showed us a couple of tricks he has for days that seem slower at first, and it made all the difference. We planned on meeting early. I was actually on time for a change, and we were ready to float by around 6:45 or 7:00. The first hundred yards of the float was spent just trying to navigate through the maze of other river users. Once we got out in front of everyone though the fishing immediately improved. Nathan and I started out fishing, and soon we were both catching fish. The midge hatch produce some excellent fishing on a dry/dropper rig. 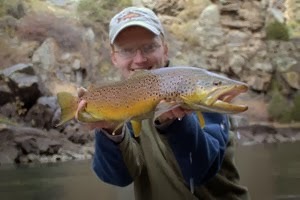 I wanted to catch some larger fish and eventually couldn't resist the call of the streamer rod. 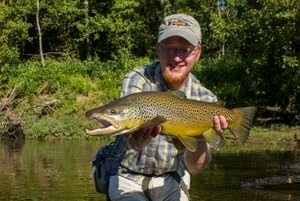 Within just a few casts with a Stacked Blond, I had a little 10 inch brown on and thought it might turn out to be a good streamer day! Unfortunately the quick success soon turned into lots of follows and flashes but few strikes. Still, I was turning fish and some nice ones at that so I was a little reluctant to stop throwing big streamers for big fish. We continued down the river and things really slowed down as the sun hit the water. The hordes of canoes coming down the river weren't helping either although most people were being polite. The glaring exception was a boat that motored by within 6 feet or so between the drift boat and the bank that was probably no more than 30 feet away at this point and probably much less. This was while I was working the streamer rod to said bank, and it was all I could do to restrain from blasting one of them in the head with a big streamer. Some people are just not very intelligent. David nailed several good fish including browns up to 17 inches. Nathan took over camera duties for awhile and we got some nice pictures of all the fish. When we were about a half a mile or mile above the takeout, Nathan took over in the front and proceeded to catch his own nice 16 inch brown. The river is slowly coming back although it has a long ways to go before it gets anywhere as good as it used to be. The numbers of fish are still not particularly good and the heavy boat traffic does not help. There are definitely fish to be caught though and even some very nice ones. I'll be looking forward to the opportunity to fish the Caney again, hopefully in the next week or two. Yesterday evening I took a trip to one of my favorite places to fish for stripers. The expedition was as much a scouting trip as an actual fishing trip. So far we haven't found the fish up shallow where it is easy to target them with a fly rod from shore. Since I don't have a boat or consistent access to one, I make do when the fish are within casting distance from shore. The trip was very useful and added a bit more knowledge to my repertoire. First, the fish weren't in our favorite spot. Second, most fish are not up feeding on the surface yet although in a few select spots they can be found busting bait. Usually they take patterns deeper in the water column, but I had to go to a Deceiver before finally hooking up. Unfortunately, the last lesson learned was more of a reminder: Don't overpower stripers...when they are ready they will come in. After a solid fight with a very nice fish, I lost the striper when the hook pulled free. Hopefully in the next 2-3 weeks things will continue to improve. There are few options here in east Tennessee that can compare with the adrenaline rush from hooking a big striper. I hope to try out some musky within the next few months, but until then, stripers are high on my list of best fighting fish here in our area. 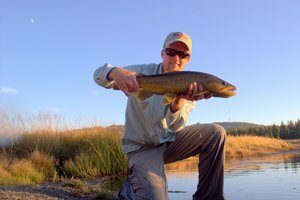 Catching lots of fish seems to be the goal of fly fishing these days. Naturally we all want to catch plenty of fish, especially since we could spend the same amount of time on the water without a fly rod if we were just out for the experience. Still, sometimes it is nice to relax and just appreciate the overall experience as it comes. My fishing drought ended yesterday. I had spent the weekend in Atlanta and was on my way back home when the brilliant thought occurred to me that the Tellico area really wasn't that far out of my way. All my fishing gear had magically been stashed in my car before the trip so everything fell into place nicely. 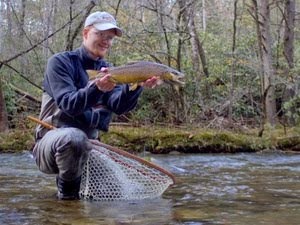 I rarely fish the mainstem Tellico, opting for small tributary streams instead where the only fish you'll encounter are wild and the crowds are slim to none. After driving around scanning lots of water, I finally just eased the car into a pulloff and got out to examine the stream. The water is getting very low so I knew stealth would be the order of the day. I casually rigged up a 9 foot 4 weight Legend Ultra and extended the leader with around 20 inches of 6x tippet. Low clear water and a lack of big fish convinced me that I could get away with tippet that was lighter than I normally use and that it would in fact improve my success. The vast majority of the time I start with a nymph, but on this day I wanted to catch fish on dries. After observing the stream and its environs, I realized that I would probably be creating an artificial hatch. The only bugs around were some extremely pesky gnats that were trying to make my life miserable. A light cahill parachute seemed like a good way to cover water. 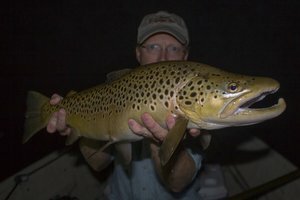 The fish here are not picky and will generally rise to just about any reasonable pattern. My guess proved to be a good one on the first cast. Catching fish immediately can often be the sign of a terrible day of fishing. The first cast curse didn't strike thankfully and a short while later I caught another. Continuing up the creek, I fished around 80 yards of water. It took me around 45 minutes to cover the section and in that time I pulled out 8 little rainbows. All were healthy and very feisty making pictures difficult.